Gasterias are native plants of the Cape Region of South Africa. They are related botanically to the aloes, the haworthias and assorted relatives within what is currently thought to be a family common to them, i.e. the Asphodelaceae. Other taxonomists place them in the Aloaceae, the Aloe Family. Regardless of how Gasterias are formally classified, the genus is characterized by succulent leaves arranged either in two ranks (distichous) or in spiraling rosettes. The Gasteria flowers are tubular in form, with a portion nearest the stalk shaped like a belly (i.e. gasteriform, from the Latin gaster or "belly"). Within these parameters the genus has apparently evolved into 20 species and roughly 8 to 10 varieties. About 10 years ago a book was written on the genus Gasteria by the eminent South African botanist, Ernst van Jaarsveld. It is called "Gasterias of South Africa". Now, unfortunately, out of print, it is becoming expensive. I recently found a copy for US$50 but all others were around $100 each! Nonetheless for the serious gasteriaphile this book is a must. In horticulture Gasterias are fairly easy to grow. In my experience far easier than the Haworthias. Like any succulent plants they favor an open, easily draining soil mix which should be kept on the dry side and they thrive in warm to hot temperatures, being more or less dormant in the cold months. For more complete information, see the Section "Cultivaton of Gasterias". Beginners to growing Gasterias are naturally interested in where or from whom they might acquire some of these seldom seen plants. I can but relate to you my own experiences. Some of my first Gasterias were acquired from very ordinary sources such as K-Mart, general nurseries, and also from acquaintances. These Gasterias were, of course, the most common species and varieties, such as Gasteria bicolor var. liliputana, the miniature variety of bicolor, and Gasteria carinata var. verrucosa, the conspicuously tuberculate form of carinata. Less commonly encountered but by no means rare is Gasteria nitida var. armstrongii, a most unusual looking succulent with but a few broad, dark-green leaves, held horizontal and close to the ground. You will notice that all three of these Gasterias are varieties of their species. I always found this curious and wondered why the species themselves were not the ones most encountered. 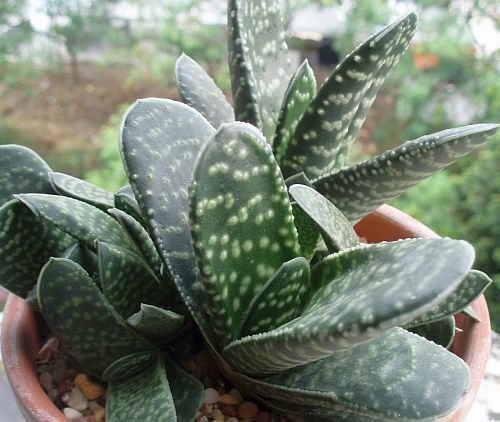 If one wishes to acquire the less commonly offered Gasteria species and varieties, it will be necessary to deal with succulent specialty nurseries or to make the acquaintance of other gasteriaphiles. Some of the well known succulent nurseries operate as mail order businesses. These outfits have a much more extensive array of Gasterias for sale. Check the "Links" section of this website for a listing of quality succulent nurseries with good selections of Gasterias. I am particularly impressed with the selection, quality and good business practices of Burks' Nursery, Arkansas, USA. Also, from time to time the Gasteria Reference Collection itself releases limited numbers of plants and seeds. Any such distributions of material will be announced on these pages. I believe that there is much more to enjoy and learn about Gasterias than most succulentophiles suspect. I foresee that the genus will become more popular in the coming years. I have decided on my own to establish a Gasteria Reference Collection for North America. broyeurs vegetaux pas cher. In my opinion what makes Gasterias interesting is that each species is quite unique. In related genera, such as Haworthia, one often encounters entities which are hard to place in one species or another–lines of distinction are uncertain. This seldom occurs in genus Gasteria. Along these beaches, just beyond the highest tide, there grows a very dense, low-growing vegetation. At first glance this shrubbery appears to be only knee-high, so you get the idea that you can just walk in amongst it, or even on top of it. But once you get there you discover that the shrubs are chest-high and higher. They take root in the sand dune and then grow up above it in a dense canopy, and it is this canopy that gives the appearance of being a short carpet of vegetation covering each dune. There is no way into and through this stuff, trust me! And yet this is exactly where one finds acinacifolia in small breaks where the plants are growing on the edge of the thicket. Another significant aspect of Gasteria acinacifolia is size. It is one of the two largest species (the other being G. excelsa). However, acinacifolia is large in overall length of leaves which gives each plant a great span, leaftip to leaftip, while excelsa is simply massive, with big, thick leaves. There is relatively little variation within the Gasteria acinacifolia complex, far less than one sees with some other species (e.g. carinata, et al.). Other than some differences in foliage color and size, an acinacifolia is always an acinacifolia. It is a grand species and quite rewarding to cultivate – if you have the room! "Something old, something new..." could be said of Gasteria armstrongii. This "new" species of Gasteria was once a variety of Gasteria nitida. However in the last week (this essay written July 30, 2004), I have received news that Ernst van Jaarsveld, the Dean of Gasteria taxonomists, has recently decided, by virtue of DNA studies, that armstrongii is a species in its own right. This is an interesting development for old Gasteria students like me, because I have often wondered whether armstrongii was just a "kind" of nitida. True, one does see intermediate forms that appear to be part nitida and part armstrongii, but in its most characteristic form, Gasteria armstrongii is very different indeed from the typical Gasteria nitida. More will be said on distinctions in the essay on Gasteria nitida, but basically Gasteria armstrongii has the following diagnostic traits: a distichous habit, leaves short, rounded and thick, and held low to the ground, of one dark-green color without prominent spotting, and a comparatively limited geographic distribution mainly in and around Humansdorp, Eastern Cape Province. The roots of Gasteria armstrongii are also different from nitida, being thick with little branching, and endowed with the ability to contract, physically pulling the plant down into the ground during dry weather. It is well known among those conducting Gasteria field work that armstrongii can be exceedingly difficult to locate - the leaves are more or less horizontal and when the whole plant is at or below grade, the surrounding soil begins to cover up the plant! Gasteria armstrongii contains some of the most handsome individual clones of any species. With their dark-green to almost mahogany-brown coloration, sculpturally compact leaves, and convenient small size, armstrongii plants deserve a place in any Gasteria hobbyist's collection. Gasteria batesiana is the Gasteria that first caught my interest, and eventually led me to specialize in this South African succulent genus. Actually it wasn't even a real plant that I first saw; rather it was a wonderfully painted color plate that appears in Ernst van Jaarsveld's book, "Gasterias of South Africa". The painting is by the late Ellaphie Ward-Hilhorst. I've included it here along with photographs of the various batesianas in order to show you what captivated me! As can be seen, especially in the color plate, Gasteria batesiana has an almost reptilian appearance. The minute, differently colored tubercles on the leaves' surfaces very much resemble those minute scales that comprise reptiles' skins. That it also has but a few leaves, and those quite "chunky" and "heavy", carries forward the association. As can be seen by the photos on this page, Gasteria batesiana does have quite a bit of variation from one population and region to another. On the whole it is a northern species in South Africa, inhabiting some of the more subtropical climes. The various forms have often been named, or given cultivar status, and one has gone on to become a variety with botanical taxonomic status (i.e. the Penge plants, now called variety dolomitica, q.v.). The type plant for the species is similar to the color plate painting mentioned previously, and these plants are found in the Pongola Valley area. It is the form most often encountered in the trade and has been given the name 'Pongola'. Gasteria batesiana presents few problems in cultivation, being an exceedingly "forgiving" species when it comes to the sometimes hit-or-miss culture given it by novice succulent enthusiasts. It can hence be recommended as a good species of Gasteria to start with in cultivation. Raising Gasterias and Haworthias from seed (or any kinds of succulents for that matter) can be a very rewarding and satisfying experience. Often, desirable species are not available as plants but can be acquired as seeds. And purchasing seeds is much less expensive than buying a fully grown plant. The only problem is that sometimes it is difficult to grow plants from seeds if one is not well-versed in the techniques. I often hear tales of trouble germinating seeds and/or keeping seedlings alive. Here's how I go about raising plants from seeds. Keep in mind that there is no substitute for experience. And also remember that I am still learning how too! Here shown are the two pots in the germination chamber. The seeds were sown in these containers and each pot measures 9 cm X 9 cm, by 9 cm deep.Here shown are the two pots in the germination chamber. The seeds were sown in these containers and each pot measures 9 cm X 9 cm, by 9 cm deep. Once I used very shallow containers such as Stouffer's frozen dinner trays and salad boxes from Kentucky Fried Chicken. These were on average about 1" to 1½" (3-4 cm) in depth. But Steve Hammer convinced me to try using plain old square plastic pots, the 3" wide by 3" deep kinds. This gives added depth to the seed bed. The lighter the mix the better. I used to add sand and use a lot of peat moss and no perlite or pumice. Now I eschew the sand, use those commercial soil mixes like Schultz's or Peter's, and I make sure there is some fine-sized pumice or perlite added (if the commercial mix doesn't have it already). These pre-packaged commercial mixes should be sterile. If you make your own potting soil with a peat base, heat your mix for 30 minutes at 300°F to kill pathogens, insect eggs, algae, etc. Steam is better. Don't let the heated soil get real dry. Use moistened soil if necessary before heating it. First I make sure the soil is damp by watering from below. The soil takes up the water via capillary action. Once I know the soil is damp, I sow the seeds on top of the soil mix and then gently but firmly tamp them down with a blunt instrument. I'm careful because sometimes the seeds will stick to the tamping down instrument! Next I just barely cover the seeds with more soil. Then I just barely cover the soil and seeds with a thin layer of sharp sand just so that the seeds are covered by a few grains of sand, which would, I guess, give a sand depth of 2-4 mm (1/8"). I put the now sown pots in a plastic bag(s), or you can use an old aquarium, or some of those transparent shoe boxes or whatever. Just be sure the pots are in a high humidity environment. Check the pots daily to be sure that the atmosphere inside isn't so wet that you get heavy condensation build up. If this is the case your soil mix is too wet and you will need to vent the enclosure a bit to allow moisture to escape. What you are shooting for is just a thin layer of condensation on the inside walls. At some point the moisture will evaporate from the soil mix itself and this can happen even if you still see a moisture film on the enclosure walls. You need to periodically spray the seed bed with a fine mist of water until the water percolates down into the soil mix. After doing this the condensation will increase again. Just vent it some as before, to control it. Keep the container in bright light (not full sunlight) and have the temperature in the day around 80°F (26°C). At night it can fall to the high 50's or low 60's (14°16°C) if necessary, and this may even benefit some species that come from winter rainfall areas, such as Gasteria disticha and pillansii. Some people claim that this difference in temperature between day and night is good for the germination of all the species. Here is shown a closeup photo of one seed germination container. The small, young seedlings are clearly visibleHere is shown a closeup photo of one seed germination container.The small, young seedlings are clearly visible If the seed is good quality with good viability, it should/could germinate in as little as 8 days. If they take longer to germinate, allow at least a month before calling it quits. If it is high summer and very hot give it even longer! Say put the seed pot away til Fall and then try again. Keep the seedlings in the enclosure for a few months, or until the number of leaves reaches say 3-5. If you don't give them this long-term protection and high humidity the seedlings will dry out and die. When the seedlings look as though they are ready for a slightly wider world, begin to GRADUALLY open the plastic bag or the lid of the container. The idea is to gradually acclimate and harden off the young plants. Despite the best efforts of the soil manufacturer or your own efforts at soil sterilization, nasty critters and diseases can still become a problem. If you begin to see little tiny critters running around the surface of the soil you have the dreaded fungus gnat (Sciarid flies). Immediate action is required! Use Gnatrol to kill the larvae that you can't see, but which are still in the soil. You can also use the milder insecticides as a soil drench. If you get algae growing on the surface of the soil you can use an algaecide rated for use in goldfish bowls/tanks which is not toxic to wildlife and other living creatures. Seedlings grow rather slowly at first, so be prepared to be patient. However, I have noticed that the seedlings tend to suddenly get established for some unknown reason and then they begin to grow much more quickly. Once you have reached this point, your long term success is almost certainly assured! After a year your once tiny plants should begin to start looking like real individuals. Depending on the species, they will not start to look like the adults until several years later but you have the beginnings of some really nice plants. Enjoy!